A new day with Es on 6 meter! On Monday I have my part-time day and a little bit more leisure time. In the afternoon I have only one hour sports to do. When I turn on my set this morning I heard already signals on 6 meters. Between 10:30 to 11:30 local time there was considerable activity and I worked the following stations: YO5PLD in KN34CK. YL2CZ in KO06XW, new square. And YU2MMA in KN04HG, also a new square. I heard the signals of E4X but his cw speed was very quickly. In combination with split working it was hard to follow his transmission. After I wrote in my blog yesterday, I had made some more qso's on 6 meters to Estonia, Croatia and Finland. All the qso's made with Morse-code. The Es was still going on but I had to stop, this morning I got up early to go to work. Tonight I am writing cards to send. I use this QSL (cards) as confirmation of the qso's I made. Es opening on 6M, again! Es season has really started. Today, after 16:00 UTC, I worked 4 stations (cw) from Finland, Estonia and Lithuania. 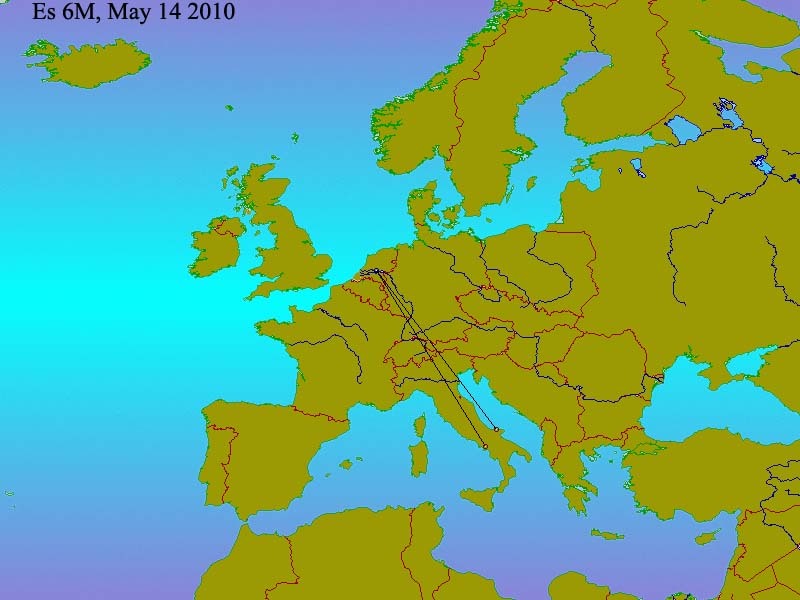 Distances between 1500 and 1800 km. 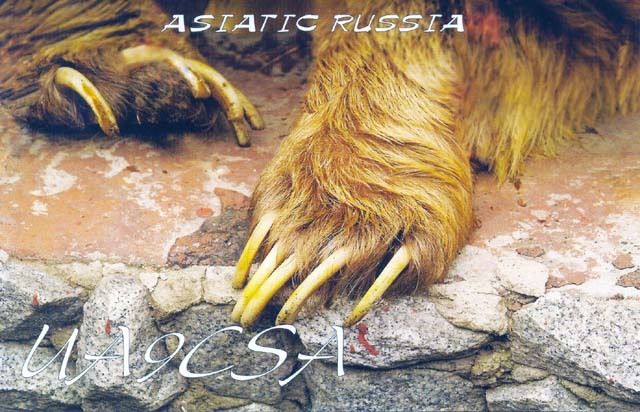 Via the mailman I received a QSL from MM0CAE today. I'm a member of the GQRP club and this club has a own QSL service between members. This was from a 2 way QRP QSO in 2006. Another day at 6M Es. Another day at 6M Es. 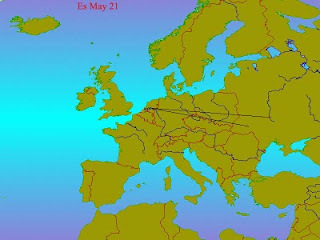 According to the data on the internet there was all day in Europe the possibility to make QSO's. Before diner I worked with a station in Poland, SP3JMZ in JO82KJ, a new square. The power from my FT950 was 10 watts. Good luck the comming period on 6 meter with Es. Today there was a big Es opening for hours, not only on 6M but also on 10 and 4 meters. I was only active on 6 meter, I have no equipment for 4M. SP7HKK - JO91QI All QSO's where made with SSB, the last one with just 5 watts, the others with 20 watts. The Es was still going on but I had to take care for my diner and other priorities. During this Sunday, I had the goal to go into the field with my FT817nd and mobile whip for 20M. I had the mobile whip for 6M also taken with me. With the internal battery the output is 2.5 watts. When arrived on location in JO21QW I parked the car on the side of the road and put the ground wire of about 5 meters rolled out across the grass. With the rig in the hand this way I got a good SWR. In terms of reception I was very pleased. In about 2 hours I worked to my great surprise, 3 stations. RW1CW, who was working in a contest. IV3NVD, they always called with a reference of UD128 (What is this mean?). Finally I worked with Rick, TK5/F2PI/M. This station was mobile in Corsica with 100 watts from the car and mobile antenna. I have also called to several other stations, including OH0/PA3BAG. Jack heard me but it was not a complete QSO. On 6 meters I heard some weak signals, calls had no effect. In the beaconband I heard SV3BSF. The experiment was successfull for this day. It is possible to use a very small antenna, even if it takes more effort. Last week I found this site about this way of operating made by Roger G3XBM. When I getting out of bed this morning, around 08:30 local time, I turned my rig on to hear if there was something to do on 6M. According to the DX cluster much activity but I heard not too much. Around 7:15 UTC, I worked with ER1SS in Moldova (KN46JX). This is a new DXCC country for me on 6M and also a new square. The rest of the day remained silent on 6M, and I've done other things. When I came home of my work I switched on my Yaesu FT950 and heard several signals on 6M. This signals were stronger then earlier this week. Worked with: UR5URW in KO50FF (ssb) and UX1BZ in KN29VA (cw). KN29 is a new square for me. Heard also other stations but it was crowded and there was a lot of fading on the signals. When I came home from my work I switched on my radio. Worked 1 station on 6M, EA1EDU in JN01WK (ssb). JN01 is a new square for me, the third for this season. Heard a few other signals from Spain but they were to weak for me to work. After this I take time for household and a visitor. De Benelux QRP Club heeft vanaf vandaag een eigen plek op de digitale snelweg. We werken er hard aan om de website zo spoedig mogelijk naar deze locatie te verplaatsen. 23-05: Website staat op zijn nieuwe plaats, bqc. Today we had Es on 6M but not really good for the Netherlands. Between 11:30 - 11.45 UTC, I worked with: YU1SV (cw) in KN13DV and YU7RF (ssb) in KN05PC. When I was on the local meeting last Wednesday someone told me that 17M is in a good shape the last days. Special at the end of the day till late in the evening. Yesterday I tuned my magnetic-loop for 17M to find out what was possible on this band. On that moment (21:00 UTC) I heard one weak ssb signal but didn't copy the callsign. When I woke up this morning I saw on my laptop the results. Today I made the first qso's on 6M via Es for this season. I saw on the internet that there were weak signals for the last few days but I didn't hear nothing until today. The picture shows the 2 qso's I made. Around 15:00 utc I heard IK7FPU with cw and I answer him with 20 watts. This station is in JN71SU, a new squaere for me. Around 15:30 I heard IK8OFO calling in SSB. After a few calls I worked him from JN70HR, also a new square. 2 qso's and both a new square. I'm waithing for the next Es opening on 6M, I hope signals will be stronger then today. A beacon list for 6M. On Wednesday I had the whole day WSPR on 10M running. During this time I heard no signals from other WSPR stations. My signal was heard by 2 stations for a period. PAøO heard my signal over a distance of 172km. What kind of propegation was this? Every second Wednesday of the month we have a meeting with local radio amateurs in this area. During this evening the QSL manager of R30 is also present. This time there where some QSL for me to. The card of UA9CSA jumped out for me. This is a qso I made with my homemade Rockmite with a power of approximately 300mW. The confirmation of this QSO made the confirmed DXCC countries with QRP on 52. Yesterday I started this project, unfortunately I can not finish today. This morning I saw that J3 + J4 is not in the box I received. I wrote a email with the request to send the missing parts. 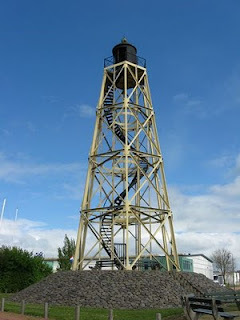 Last week I toke some new pictures of lighthouses in the Netherlands and today I updated the page about this subject. I still have my holiday from work and have a little bit more time for the radio-hobby. From Sunday evenening I listen and transmit with WSPR on 6M. No one heard my signal (except PA3MET) and I heard only his signals. WSPR is switched off for this moment. It's another rainy day. No weather to be outside and I started with kitbuilding. A few weeks ago I ordered this kit. Tomorrow I make a photo for publication on this Blog. With 1 watts via WSPR to VK! Yesterday my WSPR station listen and transmit on 40M. A lot of stations received my signals from 1 watts down to 50mW. VK6BN received my 1 watts more then one period. In the begin of the evening (May 7) I made my first qso on 10M for this season. S58P gave me a 55 with my 5 watts in SSB. With 1 watts to VK via WSPR! Yesterday in the evening I setup my station for WSPR on 30M. Around 19:00 UTC 2 VK stations heard my 1 watts signal, VK2/VK6DI and VK2DAP. Distances around 16500 km. Later in the evening I made 2 CW qso's on 30M. Worked with OM30CAQ and a longer qso with SP7HOV, Zbig in Skierniewice. Both qso's with only 1 watts. On my laptop I don't have the possibility to make graphics for my Blog. When I'm back home I update the Blog with pictures. After a holiday of a few days in the province of Friesland I'm in Zuidlaren (JO33IC). Yesterday in the afternoon I start up the station for WSPR. The best DX was K1JT, he heard my 500mW signal. Today my WSPR station is running on 10M and OY1OF heard my 1 Watts signal for one period. PE4BAS and PC1CP heard my signal serveral times. from 5 watts to 50mW. On 40M I made 1 CW qso with DF3MI in QTH Oberammergau. A 2way QRP QSO.